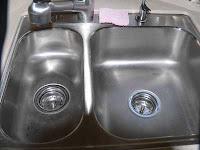 I own an older motorhome and the bathroom and kitchen water fixtures are beginning to tarnish. They still work okay, but I want to replace them to be more in-line with our interior wishes. What is the difference, if any, between an RV fixture and a standard home fixture? If I upgrade to a higher grade fixture to get what I want, will there be any performance issues within the motorhome? Ron, you should have no problems whatsoever replacing the faucets in the motorhome with a higher grade of aftermarket faucet. The hole spacings are the same in RVs as they are in home applications for both lavatory and kitchen sets. The only negative would be the added weight of heavy brass faucets compared to the lighter (and cheaper) plastic faucet assemblies’ common to many motorhomes. But still, that would be a minimal consideration at best. Any of the big box stores will have a plethora of choices to peruse, (too many in my opinion), and all will work in the motorhome. Just be sure you have the correct fittings to adapt to the existing water supply tubing in the coach. Typically, the faucet kit will come with the needed adapters.